With centuries of iconic design to draw on, Italy is home to many expertly styled drinking establishments. In Milan, you can enter a bar and be transported back in time to Italy’s rationalism of the ‘30s or the iconic industrial look of the ‘50s. 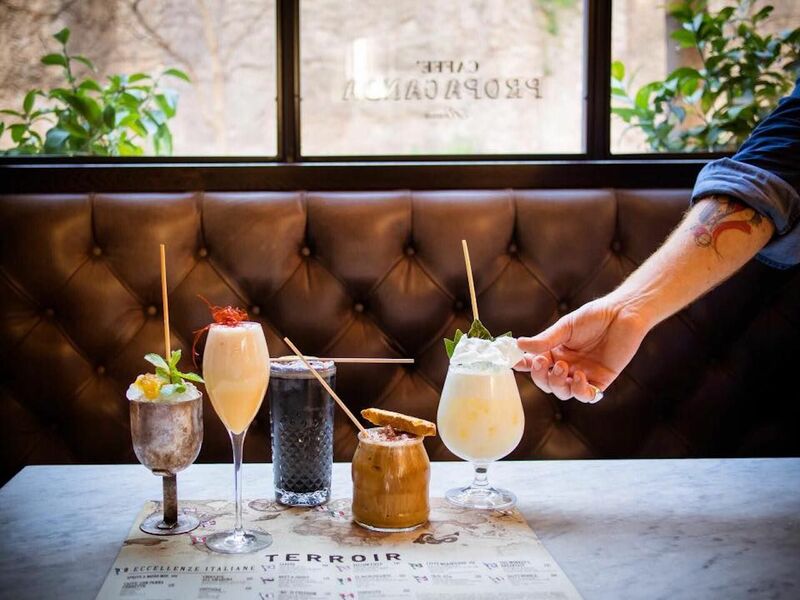 Further south, convention goes out the window with a flamingo-filled tropical bar in Puglia and a smoky speakeasy in Rome. A trip to Italy is filled with beautiful architecture and design, which goes just as much for the bars as it does the fashion and historical landmarks. 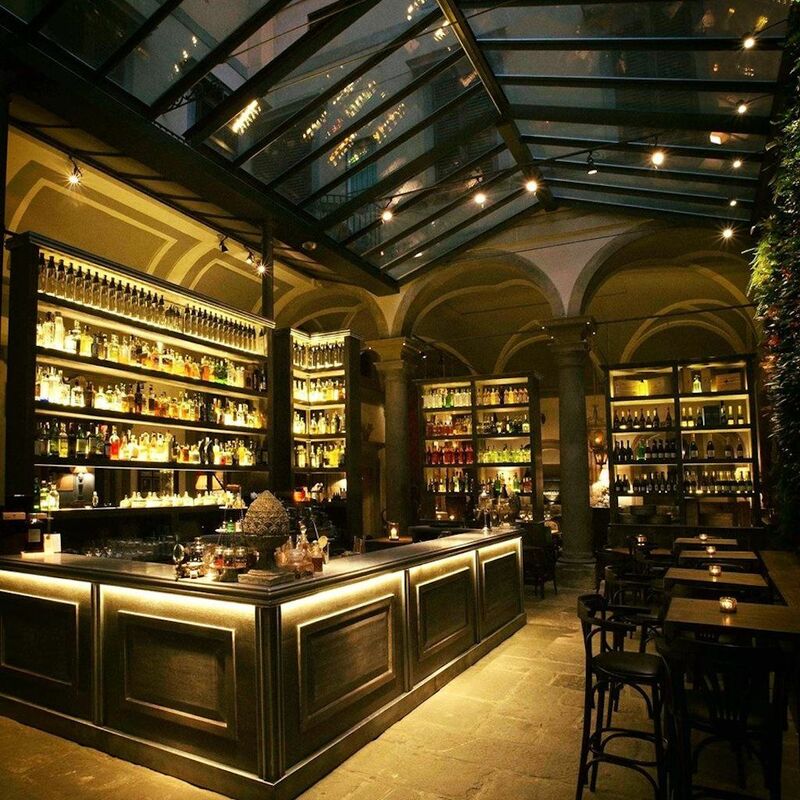 Make sure these well-designed bars are on your next Italy travel itinerary, both for the drinks and the atmosphere. Ceresio 7 is a rooftop bar and restaurant located on top of a historic rationalist building in Milan built in the Fascist era. The interior design takes after the exterior with a rationalist ‘30s aesthetic characterized by clean, geometric shapes. There are rectangular, brass-topped booths, floor-to-ceiling windows, red lacquered tables, plush teal chairs, and suspended strip lighting. This bar menu features classic American cocktails with a “strongly Italian twist and identity” and house-made bitters. 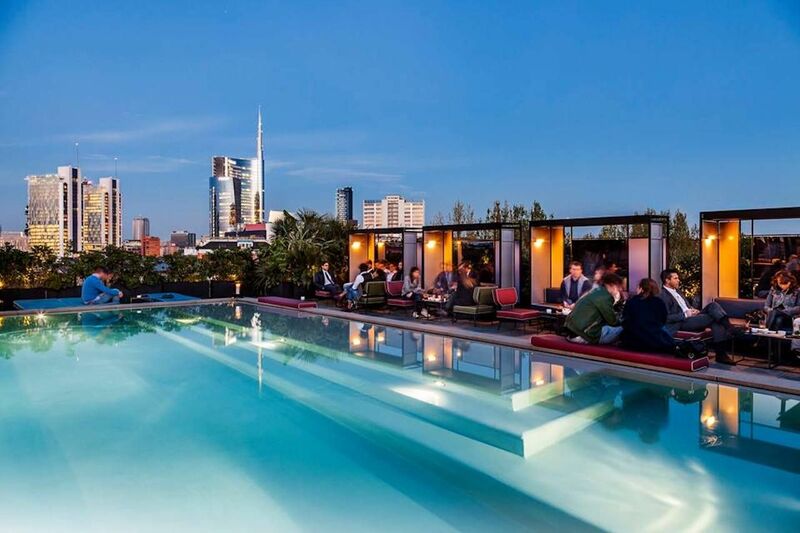 Ceresio 7 aims wholeheartedly at the luxury market with a terrace and swimming pool that overlooks the Milan skyline. Here, too, the vintage look is continued with angular turquoise leather sun loungers, grey stone floor slabs, and individual booths with Mondrian-style rectangular panels. 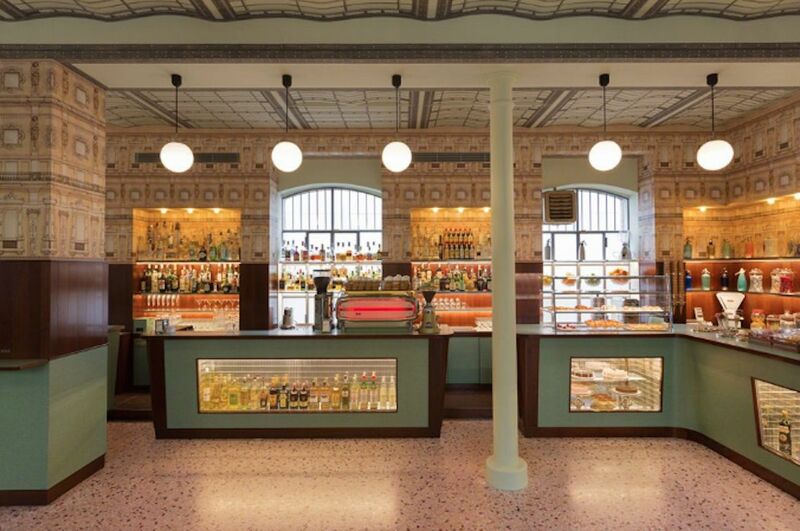 Located in the cultural complex of the Fondazione Prada, this idiosyncratic bar was designed by Wes Anderson. Bar Luce bears all the hallmarks of his retro style, with Formica furniture, an industrial-style bar, and veneered wooden panels. The subdued turquoise and beige color palette is typical Wes Anderson but also harkens back to the aesthetics of 1950s Italy. Anderson’s design kept specific elements of the original structure of the building, such as the arched glass roof that’s a scaled-down replica of the ceiling of Milan’s famous shopping arcade, Galleria Vittorio Emanuele. Anderson described the interior as just like one of his film sets and as “a bar I would want to spend my own non-fictional afternoons in.” This is the place for a classic Italian drink like a Campari soda. Caffé Propaganda’s style and inspiration is eclectic. White, subway-style ceramic tiles cover the walls, and light comes from big factory windows. Rustic French bistro decorations like pots and pans hang as decoration, enormous chandeliers hang from the high ceilings, and Bauhaus-inspired stools are at the bar. The airy space and black and white floor make it temptingly fresh in summer, and it’s conveniently located a short walk from the Colosseum. The treats menu offers plays on classics like tiramisù and macaroons, and the cocktail menu is designed by in-house mixologist Patrick Pistolesi. Italian design studio Dimora transformed an old grocery store into the tropical-themed Bit — Bloom in Town bar. It’s replete with tropical plants, flamingo-shaped neon lights, and botanical- and flamingo-inspired wallpaper. There are three different spaces in the bar with various inspirations. The first large room plunges you into the quirky world of exotic vegetation, the second draws on the bright colors of Cuba’s streetscape, and the last attempts to emphasize some of the building’s original features, such as the stone walls and vaulted ceiling. The food options include traditional Puglia staples, like burrata topped with crumbs of taralli biscuits, as well as sushi. Bar Locale is in a Renaissance palace and takes full advantage of one of the finest historical periods of Italian architecture. The space echoes the pre-existing elegant arcades and colonnades of 16th-century architecture with a wood-paneled bar and soft lounge lighting. There’s a glass retractable roof over the garden area, and elements of the original decoration are preserved all around, from ceiling frescoes to stone sculptures. Downstairs in the rustic stone cellar, it feels like the 1200s but with industrial metal lampshades and long wooden tables. Go for the cocktails more than the food. The drinks are like something out of a chemistry lab with complex mixes, and each is served with a dramatic presentation. Be prepared for high prices. 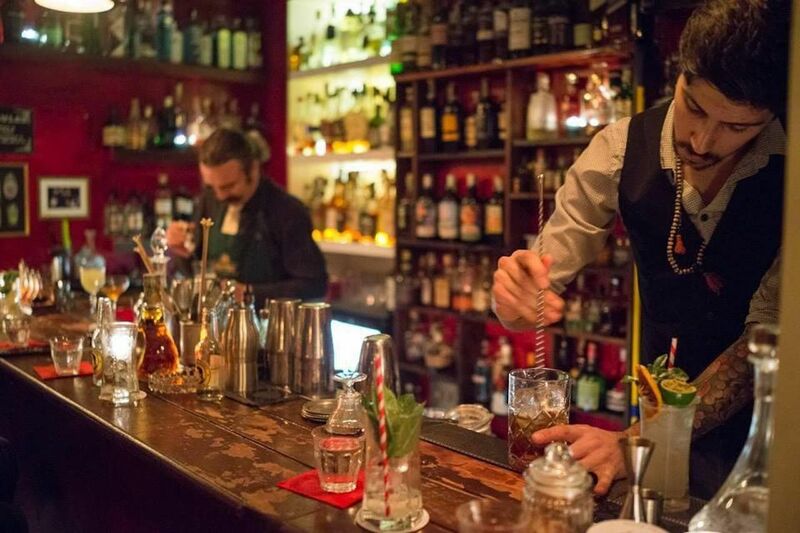 The Jerry Thomas Project is a members-only bar in Rome. Reflecting its desire to be “secret” and exclusive, the interior is dimly lit with leather armchairs in shady corners. It has deep red walls decorated with ‘20s-style signs and Jack Vettriano prints. Behind the bar, there are crooked wooden shelves filled with bottles. A soft tobacco-smoke haze fills the interior. Barmen with beards and ‘20s-style waistcoats prepare the cocktails, which they claim are the result of years of studying, cultural exchanges, and collaborations. There’s just one important restriction: No vodka allowed. For several years in a row, The Jerry Thomas Project made it on the coveted 50 Best Bars list. To visit, correctly answer a question on the bar’s website to receive the entry password. 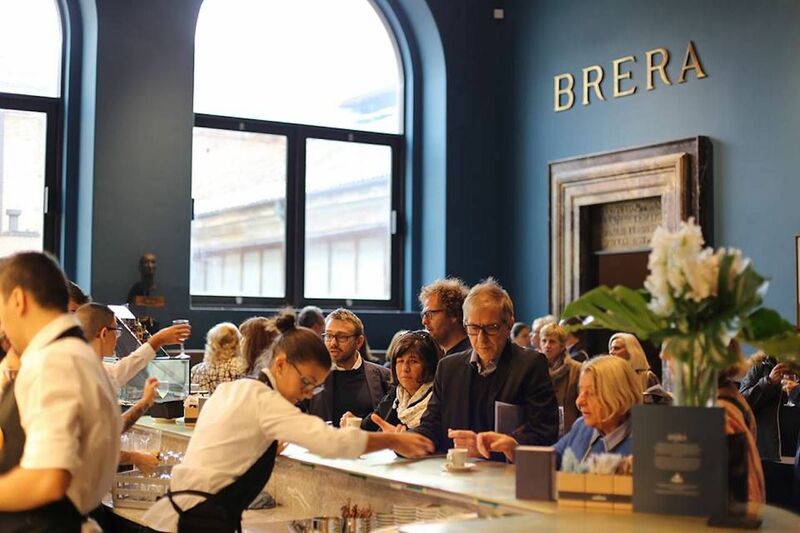 After visiting Milan’s Brera art gallery, stop off for a coffee in its bar, Caffé Fernanda, for another kind of artwork. The teal walls and dusty rose pink upholstery are in a similar vein as Wes Anderson’s interiors with a distinctly 1950s Italian aesthetic. The long bar has thin wooden panels and a brass top, and the geometric shelves behind are brass as well. Here, the art doesn’t stop in the gallery. The bar is decorated with several paintings and sculptures from the collection, such as the monumental 17th-century scene above the bar, which perfectly mirrors the length of the counter below. Sitting at the bar, you also get a privileged view into the last room of the gallery, where the famous kiss of Francesco Hayez is hanging.